St Johns Church Arrowtown is a congregation of the Wakatipu Community Presbyterian Church located on the corner of Durham and Berkshire Streets. Family-friendly morning services are held at 10am. There is a programme for school children and for preschoolers during the school term. 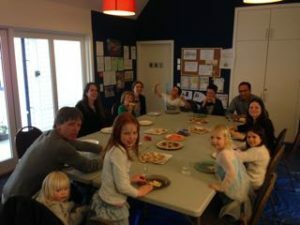 Our children’s ministry at St John’s Presbyterian is a spiritually forming, parent-empowering ministry that equips children, leaders and families to know Jesus and live out a vibrant lifetime faith. Discoverers helps our pre-school kids and their families connect to God, find their place in His big story, and respond to Him through the power of the Holy Spirit. This is done in a fun and creative way where they discover that God made them, God loves them, and God is with them. Our Epic programme invites primary kids to explore the Story beneath all the stories in the Bible. We want out kids to know that the Bible isn’t a book of rules. Or a book of heroes. The Bible is most of all a story of how God loves his children and comes to rescue them. From Noah to Moses to the great King David, every story points to a Child. The one upon whom everything would depend. Kids are encouraged to explore for themselves the one who is at the center of God’s great rescue story — and at the center of their story, too. And as they do to develop and grow in their relationship with Jesus. Once a month during school term we have an all-age interactive gathering. This takes place on a Saturday from 4-6pm and finishes with dinner together (provided). This gathering explores the Christian faith through arts, crafts, games and story. During the week with two sessions of mainly music. 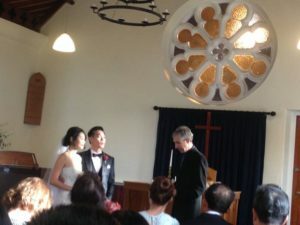 St John’s is a popular venue for your Queenstown Wedding Service. These are normally held in the church but can also be held in the hall which has greater seating capacity. The Minister of the parish is responsible for conducting weddings at St John’s. Please read our marriage and weddings policy as found by clicking this link. A 2011 addition to St John’s is the church community hall available for hire with seating for up to 200 people. The hall features high standard audio-visual equipment, central heating, fully equipped kitchen. Toilet facilities include wheelchair toilet and baby change table. Existing old buildings include restored and well-heated church, meeting room and office. Video and sound link from church to the hall. The hall and all buildings are available for the use of other groups on the understanding that users respect our Building Use policy and any other requirements given to them at the time of booking. Please read the policy by clicking on the above link and speak to our office if you would like to make a booking. The stone church (cat 2 NZHPT) was built in 1873, designed by F.W. Burwell and built with the assistance of Chinese labourers, as the gold rush was over. The thick (500mm) walls were built straight on top of the ground, and it wasn’t until 1995 that a concrete foundation 1 metre deep, was poured under the outside half of each of the external walls. This was done to stabilize the building and to prevent the roots of the two Sequoiadendron Giganteum (Wellingtonia) trees that frame the entrance, from eventually destroying the church. This appears to have been successful. The trees were planted circa 1880. The wooden vestry and bedroom (now office) were added in 1880. A bedroom, (unique in NZ we believe) because the minister would sleep overnight on Saturday, after riding his horse from Queenstown to Arrowtown, before taking the service on Sunday and then riding home again. It was also used, in the early days, as living quarters for student ministers assisting in the parish over summer. In 1959 the originally Millers Flat (Malaghan Rd below Coronet Peak) Church (built 1869) was joined as a hall to the north side of the vestry, it had also been relocated in 1951 to be the Speargrass Flat Church. In 2010 it was moved again and restored to sit alongside and become part of the Miner’s Cottages Trust Precinct, situated between Buckingham St and Roman’s Lane. This move was necessary to make room for a modern new hall and ancillary facilities, to be built to the rear of the original church. This was completed in early 2011. As it is sited in the Arrowtown Historic Zone and attached to an historic listed building, the new hall had to comply with strict historic guidelines on the outside, but is very modern on the inside, with air to water heat-pumps heating the under-floor heating, extra insulation, double glazing and three 50” TV screens and audio equipment, as well as a large kitchen and toilet facilities. An audio-visual link is available from the church to the hall for large services and gatherings. The new building consists of a large hall with two lounges which can be used separately or all opened up to make one large open space, seating over 200 people. The larger east lounge opens out onto a sunny, sheltered courtyard, garden and lawn area. Once the hall was completed, work commenced on restoring the interior of the church and vestry. The pews and dado paneling were returned to almost their original stained condition. The vestry, which had been modernised in the 1950’s and lined with pinex, was stripped back to the original T&G wooden panels and one of the original fireplaces uncovered. The church is open most days for viewing. 10am *St John’s @ Arrowtown cnr Berkshire and Durham Sts. * these congregations include separate programs for children and teens.